Commencement speaker Dyann Wirth, PhD, of the Harvard T.H. Chan School of Public Health, is a world-renowned leader in the area of malaria research. Graduate Isha Sethi smiles broadly as she is hooded by Michael J. Buck, PhD, associate professor of biochemistry. Srinidhi Sridhar, a graduate in the master’s program, is hooded by Paul J. Kostyniak, PhD, as Patricia A. Masso-Welch, PhD, looks on. Andrew Hurst, who received dual degrees in biomedical sciences and psychology, is congratulated by Michael E. Cain, MD, medical school dean. A graduate is greeted by UB President Satish K. Tripathi as she receives her diploma on the Center for the Arts stage. Dithi Banerjee, a doctoral graduate, is congratulated by John C. Panepinto, PhD, associate professor of microbiology and immunology. The Royal Pitches, UB’s only all-female a cappella singing group, performs during the commencement ceremony. The graduates included Suyog Pol, who earned the first doctoral degree awarded through UB’s Biomedical Engineering program. Graduates also completed the following programs offered in alliance with the Roswell Park Comprehensive Cancer Center Graduate Division: bioinformatics and biostatistics, cancer pathology and prevention, cell stress biology, immunology, cellular and molecular biology, molecular and cellular biophysics and biochemistry, and natural sciences. 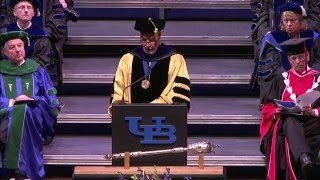 UB President Satish K. Tripathi conferred the degrees during the event at the Center for the Arts on the North Campus. Five doctoral candidates and eight undergraduates received special recognition for outstanding accomplishments. Recipients of this award have demonstrated excellence in research. Doctoral student Vigneshbabu Musuri Periasamy was honored for research that received national or international recognition and for being selected to give an oral presentation at a major national or international meeting. Doctoral student Megan M. Jones received this award for her outstanding dissertation research; related publications and presentations; and overall academic achievement. Two graduating seniors who majored in biomedical sciences were recognized with the highest State University of New York undergraduate honor — the Chancellor’s Award. Kristen A. Milleville of Tonawanda is a University Honors College Scholar who graduates with a bachelor of science degree in biomedical sciences. After spending more than 700 hours doing research in the neuropsychology lab, Milleville co-authored a neuropsychology research article and presented a poster at the UB Celebration of Student Academic Excellence. Milleville was also a teaching assistant for human anatomy and biomedical sciences seminars. Outside the classroom, she was a member of the 2015 state champion UB club field hockey team. Natasha Singh of Buffalo is a University Honors College Scholar who graduates with a bachelor of science degree in biomedical sciences and a bachelor of arts degree in psychology. In 2013, she participated in a study abroad trip focused on health care in Brazil. Her work abroad continued with two service trips to the Dominican Republic in 2013 and 2014, where she helped provide English education to the entire community of Monte Cristi. Because of her various volunteer experiences, Singh was one of 10 New York State students chosen to receive the John G. Karrer Scholarship for meritorious community service. Dyann Wirth, PhD, Richard Pearson Strong Professor and chair of the Department of Immunology and Infectious Diseases, Harvard T.H. Chan School of Public Health, was the commencement speaker. A major leader in malaria research for more than 30 years, her work has provided completely new insight into how the malaria parasite has evolved, specifically in the areas of population biology, drug resistance and antigenicity. The Wirth laboratory blends the scientific environments of the Harvard T.H. Chan School of Public Health, the Broad Institute and research institutions from across the globe to create a unique malaria research and training network that brings together scientists with expertise in molecular biology, genetics, genomics, population genetics, chemistry, cell biology, epidemiology, computational biology, biostatistics and leading clinicians in infectious diseases and pathology.